Google is hard at work on a more affordable version of its flagship Pixel 3 and Pixel 3 XL handsets. The upcoming model, dubbed Pixel 3 Lite, will boast a 5.56-inch IPS display as well as a 3.5mm headphone port – something dropped from the Pixel smartphone range with the Pixel 2 and Pixel 2 XL last year. It's not clear when the Pixel 3 Lite will launch, however, finished models of the new handset – which is purportedly codenamed "Sargo" inside Google – have leaked online, with multiple images showing the as-yet unannounced phone beside rival devices from other manufacturers. 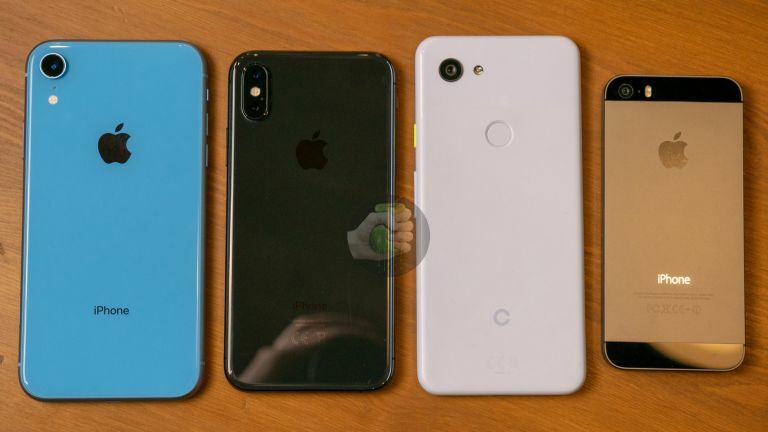 Russian blog Wylsa has published photographs of the Pixel 3 Lite side-by-side with the iPhone XS, Pixel 3 XL, and iPhone 5S, to name a few. Based on these images, Pixel 3 Lite won't be much smaller than the Pixel 3 XL, coming in at around the same size as the iPhone XR, which has a 6.1-inch LCD display. In terms of design, the Pixel 3 Lite looks to be much closer to the Pixel 3 than the Pixel 3 XL. It uses the same curved bezels around the display, instead of the chunky notch that appeared on the Pixel 3 XL and was publicly mocked by Samsung. It has the same 5.5-inch display size as the Pixel 3, however the Pixel 3 Lite will carry a lower resolution 2,220 x 1,080 IPS panel compared to the FHD+ OLED on the latter. Unlike the Pixel 3 handsets released earlier this month, the Pixel 3 Lite will have a plastic case – although it will have the same design as the flagship models. It won't carry the same top-of-the-line Snapdragon 845 chipset, replaced instead with a mid-range Qualcomm Snapdragon 670 processor. With the Pixel 3 and Pixel 3 XL starting from £739 and £869 respectively, it makes a certain amount of sense for Google to launch a more affordable version of its flagship smartphone range. The Mountain View-based firm still sells its previous handsets at a discounted rate, £629 for the Pixel 2 and £799 for the Pixel 2 XL. Whether the Pixel 3 Lite would be priced below these handsets, or somewhere between the Pixel 2 and Pixel 3 isn't clear. As always, the Pixel 3 Lite has yet to be confirmed by Google, so it's possible the handset will be quietly shelved and will never see the light of day. Stay tuned for the latest news as it breaks. Super-fast, super large, and packed with features – which of these phones is best? Samsung Note 9 vs Pixel 3 XL: will Google's big new phone take down the latest Galaxy?